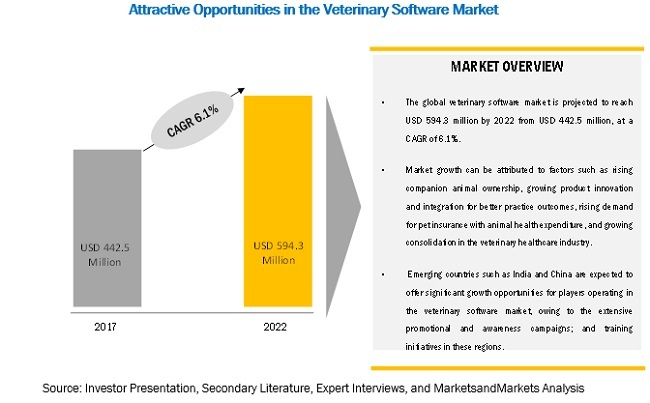 [169 Pages Report] The global veterinary software market is expected to reach USD 594.3 million by 2022 from USD 421.4 million in 2016, at a CAGR of 6.1%. Rising companion animal ownership and demand for pet insurance with growing animal health expenditure are some of the major factors responsible for driving this market. Moreover, growing product innovation and software integration by market players to help their clients with better practice outcomes, and the growing consolidation of the veterinary healthcare industry are other prominent factors that are likely to propel the growth of this market. The base year considered for the study is 2017, and the forecast has been provided for the period between 2018 and 2023. Product enhancement is one of the key growth strategies adopted by players operating in the veterinary software market. This includes the launch of new software and services, product upgrades, and the development of mobile applications (through which veterinarians can access patient databases through their cell phones and tablets from remote locations). Since veterinarians in developed countries such as the US, UK, and Canada are open to adopting new technologies, various new and advanced products are being launched in these countries. Additionally, the majority of companies are developing and commercializing business intelligence software. This software is designed to track and identify the progress of veterinary practices by automatically compiling data from practice management software to help increase the practice revenue. Such product innovations aimed at better practice outcomes are expected to generate significant interest among veterinarians and aid the growth of the overall veterinary software market. The following are the major objectives of the study. 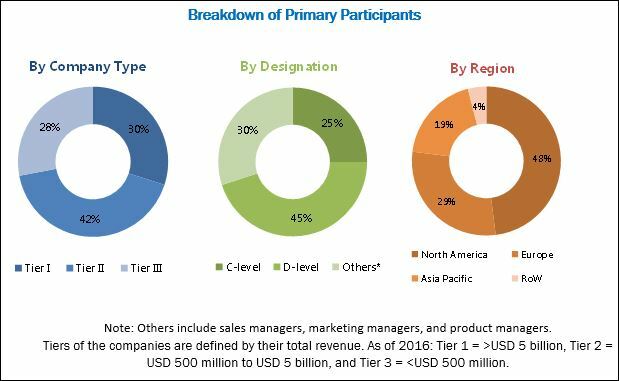 During this research study, major players operating in the veterinary software market in various regions have been identified, and their offerings, regional presence, and distribution channels have been analyzed through in-depth discussions. Top-down and bottom-up approaches have been used to determine the overall market size. Sizes of the other individual markets have been estimated using the percentage splits obtained through secondary sources such as Hoovers, Bloomberg BusinessWeek, and Factiva, along with primary respondents. The entire procedure includes the study of the annual and financial reports of the top market players and extensive interviews with industry experts such as CEOs, VPs, directors, and marketing executives for key insights (both qualitative and quantitative) pertaining to the market. The figure below shows the breakdown of the primaries on the basis of the company type, designation, and region considered during the research study. The veterinary software market comprises a network of players involved in the product development; raw material supply; and post-sales services. Key players considered in the analysis of the veterinary software market are Henry Schein, Inc. (US), IDEXX Laboratories, Inc. (US), Patterson Companies, Inc. (US), Vetter Software, Inc. (US), Animal Intelligence Software, Inc. (US), Timeless Veterinary Systems, Inc. (Canada), Britton's Wise Computer, Inc. (US), ezyVet Limited (New Zealand), FirmCloud Corporation (US), MedaNext, Inc. (US), OR Technology (Oehm Und Rehbein GmbH) (Germany), VIA Information Systems (US), Hippo Manager Software, Inc. (US), Finnish Net Solutions (Finland), Carestream Health (Canada), and ClienTrax (US). In 2017, Henry Schein acquired eVetPractice. This acquisition strengthened the company’s product line for veterinary practice management solutions. In 2016, Patterson Veterinary signed an agreement with VetSuccess, as per which VetSuccess will join Patterson’s Signature Solutions Solutions suite of products and services enabling Patterson’s customers access to customized VetSuccess reports. In 2016, Patterson Veterinary partnered with Vetter Software to develop eShelf, a cloud-based software that provides veterinarians with a way to manage inventory in their clinics. The software allows veterinarians to set alerts for product reorders and place orders with Patterson directly from their Vetter Software accounts. In 2015, Timeless Veterinary Systems partnered with Veterinary Pharmacy Reference On-line to develop and release a new web-based Veterinary Pharmacy Reference software. What are new application areas which the veterinary software companies are exploring? Which are the key players in the market and how intense is the competition? 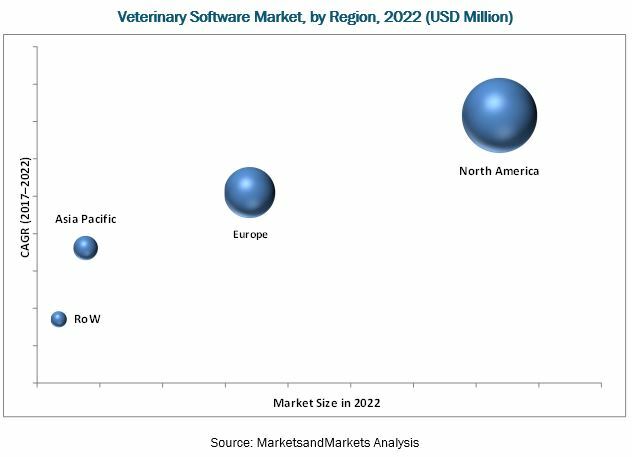 The global veterinary software market is expected to reach USD 594.3 million by 2022 from USD 442.5 million in 2017, at a CAGR of 6.1%. The growth of this market is mainly driven by rising companion animal ownership and demand for pet insurance, growing animal health expenditure, and growing product innovation and software integration. Veterinary software helps veterinary practices by automating several tasks using modules such as appointment scheduling, client screens, patient screens, visit screens, financial screens, electronic medical records, reminders, inventory control, and reporting. The veterinary software market has been segmented, on the basis of product, into practice management software, veterinary imagining software, and other software. In 2017, the practice management software segment accounted for the largest share of the total market. Practice management software reduces the possibilities of error and the overall cost of a veterinary healthcare facility. The veterinary software market in North America is expected to grow at the highest CAGR during the forecast period. The large share of the North American market can be attributed to the growing demand for quality pet care. This, in turn, is encouraging veterinarian practices to adopt technology solutions such as digital imaging systems and veterinary practice management software for better diagnosis. Other growth factors include growing awareness about veterinary software and the easy availability of veterinary software and services in this region. This is because most vendors operating in this market have operations in North America. The increasing number of veterinarians is also a major driver for the veterinary software market in North America. The web-based/cloud-based model runs on a server that is owned and operated by the vendor. The web-based/cloud-based model offers various advantages such as data centralization capabilities, a greater level of interoperability, and automatic software upgrading. Moreover, the data on a web-based/cloud-based model can be accessed by veterinarians from any location through the internet; the data can be accessed from a range of devices such as desktops, laptops, mobile phones, and tablets. The on-premise model uses multi-vendor architecture, which minimizes the risk of data breach and external attacks. The on-premise model allows flexibility of connection bandwidth-this feature is very important in cases where a client is dealing with heavy data file transfers. In addition, in this model, buyers have complete control over decisions regarding software upgrades. Where will all these developments take the industry in the mid to long term? What are the upcoming industry applications for veterinary software? The veterinary software market has minimal support from governments across the globe. In the US, the adoption rate of veterinary software is very low as compared to healthcare IT (HCIT) tools such as human EHR. This can be attributed to the lack of incentives or funding provided for implementing veterinary software. The slow adoption rate of veterinary software will make it difficult for small vendors to break even in the market. Moreover, in developing regions such as the Asia Pacific and Latin America, government support for the implementation of veterinary software is very low. This makes it difficult for companies to operate in these regions. Thus, the lack of government incentives is restraining the growth of the veterinary software market. Key players in the market include Henry Schein, Inc. (US), IDEXX Laboratories, Inc. (US), Patterson Companies, Inc. (US), Vetter Software, Inc. (US), Animal Intelligence Software, Inc. (US), Timeless Veterinary Systems, Inc. (Canada), Britton's Wise Computer, Inc. (US), ezyVet Limited (New Zealand), FirmCloud Corporation (US), MedaNext, Inc. (US), OR Technology (Oehm Und Rehbein GmbH) (Germany), VIA Information Systems (US), Hippo Manager Software, Inc. (US), Finnish Net Solutions (Finland), Carestream Health (Canada), and ClienTrax (US). These players are increasingly undertaking mergers and acquisitions, and product launches to introduce new technologies and products in the market. *Business Overview, Products Offered, Recent Developments, SWOT Analysis, MnM View Might Not Be Captured in Case of Unlisted Companies.